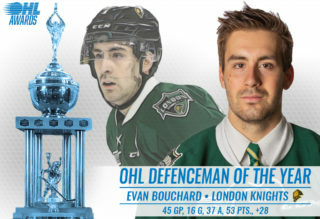 Toronto, ON – The Ontario Hockey League today announced the OHL Academic Players of the Month for October 2017, including Kevin Bahl of the Ottawa 67’s, Blake McConville of the Sudbury Wolves, Billy Moskal of the London Knights, and Brett Jacklin of the Sault Ste. Marie Greyhounds. East Division: Sophomore defenceman Kevin Bahl of the Ottawa 67’s is the OHL East Division Academic Player of the Month for October. The 17-year-old from Mississauga, Ont. carries an 86% average in his grade 12 University level coursework in English, World History, and Elite Athletics. “Kevin has had to work hard to balance his course load, on-ice commitments and physical training this season,” said 67’s Academic Advisor Eileen Duffin. A 6-foot-6, 231Ib. 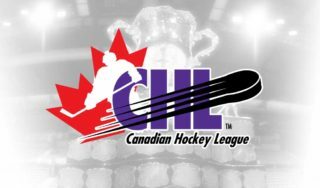 defenceman eligible for the 2018 NHL Draft, Bahl has recorded eight assists through his first 17 games of the season and was recently named to Team OHL’s roster for the upcoming 2017 CIBC Canada Russia Series. Bahl helped Canada win gold at the 2017 Ivan Hlinka Memorial Tournament this past summer. He was Ottawa’s second round pick in the 2016 OHL Priority Selection. Central Division: Rookie forward Blake McConville of the Sudbury Wolves is the OHL Central Division Academic Player of the Month for October after he maintained an 87% average over grade 12 University level Chemistry, Advanced Functions, Data Management and Online Sports Management courses. The 6-foot-2, 205Ib. right-winger has played in 11 games this season. “As a 17-year-old rookie, Blake is a respected player and student,” said Wolves Academic Advisor Gord Ewin. “He is a very positive and polite young man.” The LaSalle, Ont. native was a fifth round pick of the Wolves in the 2016 OHL Priority Selection. 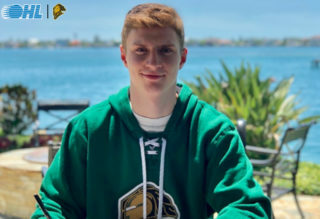 Midwest Division: Seventeen year-old London Knights forward Billy Moskal has been named the OHL Midwest Division Academic Player of the Month for October, maintaining a 97% average in his University level courses at Blyth Academy London. 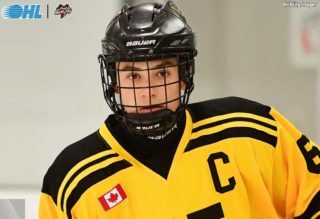 “Billy exemplifies the OHL policy of providing ‘the best of both worlds’ with regards to academics and hockey,” said Knights Academic Advisor Trish Hurley. 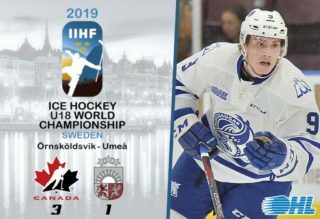 “He has participated in a number of school activities in the past year, including a fundraiser for Youth Mental Health.” Moskal has a goal and an assist through 13 games this season and recently scored his first career OHL goal on Oct. 27 against Flint. The 6-foot, 185Ib. centreman from Sudbury, Ont. was London’s second round pick in the 2016 OHL Priority Selection. West Division: Rookie forward Brett Jacklin of the Sault Ste. Marie Greyhounds is the OHL West Division Academic Player of the Month for October after he maintained an 88% average over University level Math Advanced Functions, Accounting and Chemistry courses at Superior Heights Secondary School. The Sudbury, Ont. native has two assists through his first 10 games of the season. “Brett is extremely well liked by his teachers and fellow students,” said Greyhounds Academic Advisor Jerry Bumbacco. “He is a mature young man who recognizes the importance of an education and works diligently on achieving success in the classroom as well as on the ice.” The 6-foot-1, 171Ib. right-winger was Sault Ste. Marie’s 10th round pick in the 2016 OHL Priority Selection.